The fundamental challenge of designing a dipole speaker is that the frequency response rolls off at 6db per octave as the frequency is reduced. This is a far cry from a flat frequency response! To counteract this, equalization is used to boost the power at lower frequencies relative to higher frequencies. This correction is applied by the Orion ASP throughout the passbands of the bass and midrange drivers. The conundrum is that if too much boost is applied, the drivers will run out of excursion capability and bottom out. The drivers themselves must have enough linear excursion capability (Xmax) to be driven as far as the equalization demands in order for the equalization to work. Drive them too far and they will break. The power delivered to the woofers must be limited in some fashion. If you follow Linkwitz’ recommendations and use 60 watt amps for each channel, the amp’s output voltage is not sufficient to drive the woofers beyond Xmax above 22Hz. (See his discussion and graphs here.) Above 88Hz, the amp’s current limit prevents the driver from reaching Xmax. In either case, using 60 watt amps limits the output capabilities of the woofers to about 72db at 22Hz and 94db at 88Hz. In this region, there is sufficient, unused excursion to allow significantly higher SPL before reaching Xmax if more power was available. 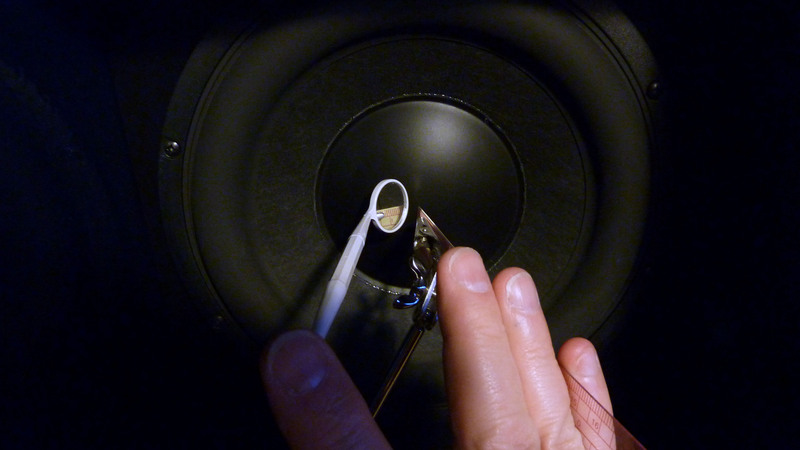 The recommended, smaller amps reduce potential damage to the woofers from exceeding Xmax. This is a simple solution to the problem. Another approach is to use the Orions with subwoofers integrated at 40Hz or even 50Hz, but that will not be discussed here. Many Orion owners using 60 watt amp report that they don’t perceive any limitations. I noticed many problems with my first set of 60 watt amps when pushed to their limits. The bass distortion, though infrequent and momentary, was simply not acceptable. When auditioning replacement amps, I selected 200 watt amps to drive each woofer. The extra power and headroom produces higher SPL and cleaner sound. 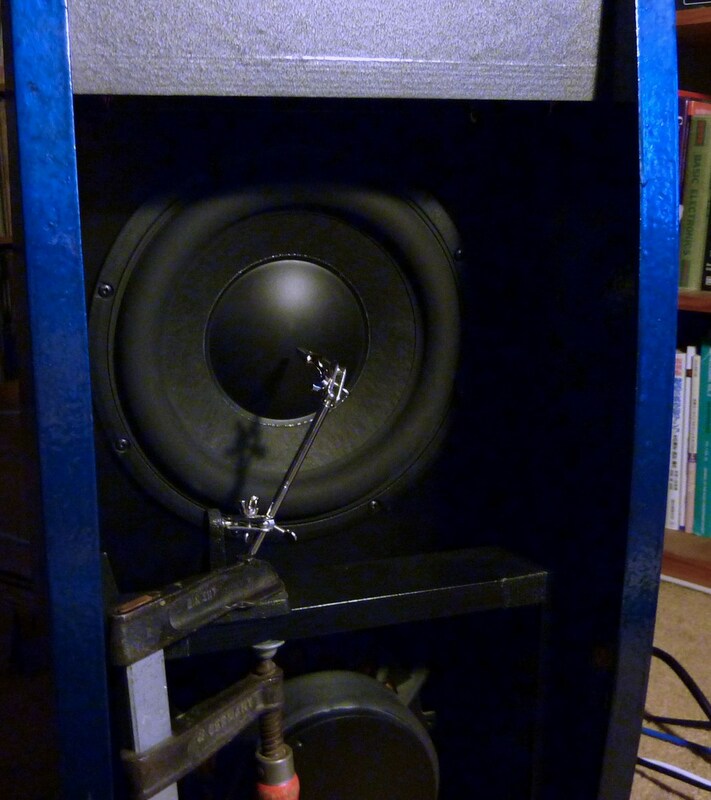 But I was constantly worried about bottoming out the woofers and so I built a subwoofer integrated at 50Hz. This works very well for loud music, and also for restoring a sense of overall spaciousness and envelopment on classical recordings made in concert halls. But the quality of the bass—timbre, subtle and not-so-subtle envelopes on the bass, unusual sounding bass instruments—suffers a little bit with the subwoofer on. 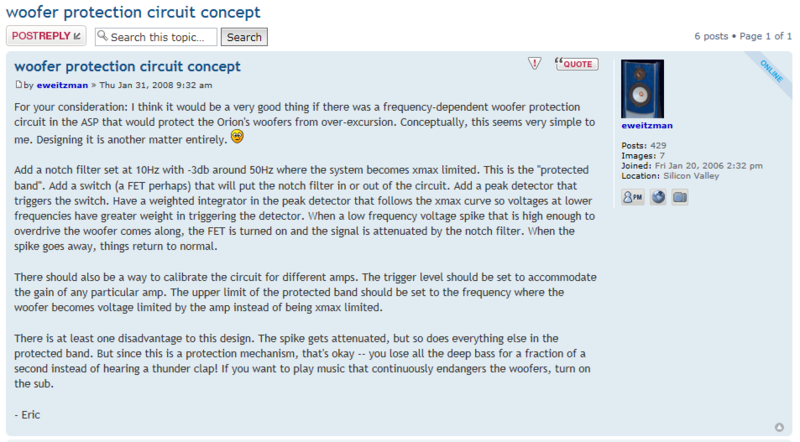 Three years ago, I posted the idea of using a frequency-dependent limiter on the Orion User’s Group forum. Recently, I solved the problem by rigging up a frequency-dependent limiter system using an off-the-shelf stereo compressor and a sidechain filter. This is apparently not a new idea, as it’s mentioned in the manual for the dbx 166A compressor I got, and also discussed elsewhere, for example, in this article. 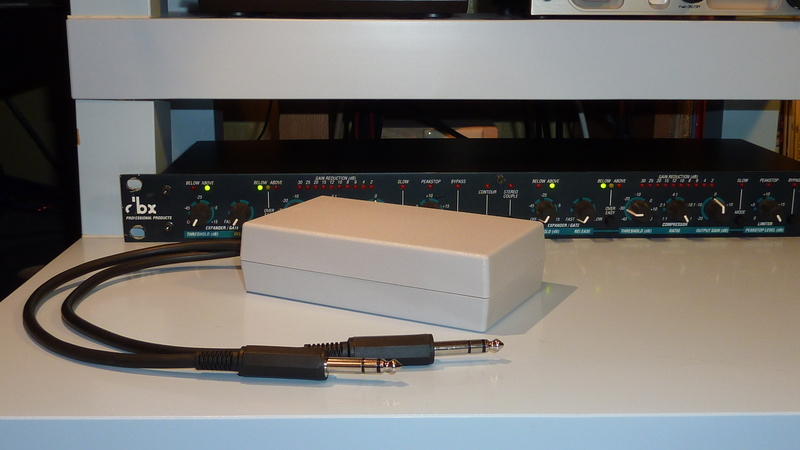 An old dbx 166A compressor is used as a limiter. It is inserted between the woofer outputs of the ASP and the woofer amps. The compressor ratio is set to hard limit the output voltage (set to 1:∞) when the input voltage exceeds the compression threshold. The signal that drives the limiter is a modified version of the input woofer signal, frequency-weighted so that lower frequency signals cause more limiting than higher frequencies. 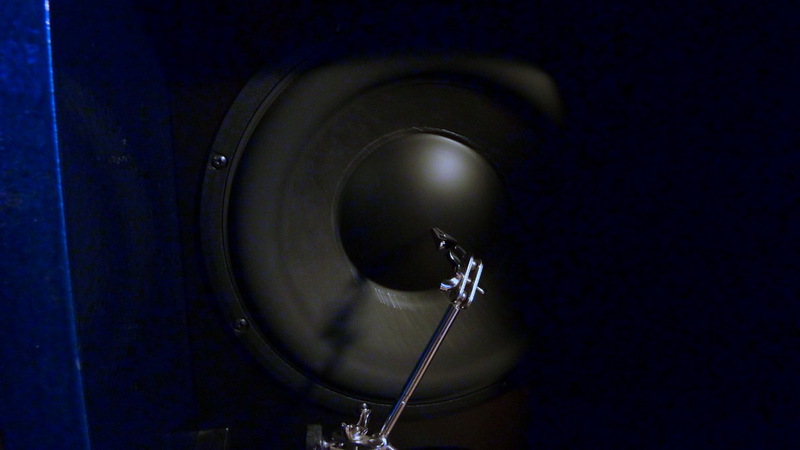 The limiting reduces the entire bass signal when an excessive peak is detected, not just the particular peak itself. This is the only drawback of the system, but is no worse in this respect than having a 60 watt amp clip and limit. The control signal is modified by a filter in the compressor’s sidechain. It took several sets of filters and measurements to come up with one that matched a set of frequency/voltage targets. The final filter is a 4th order passive lowpass filter at 10Hz. The filter was designed specifically for this compressor’s sidechain. The sidechain’s output impedance is 2kΩ and its input impedance is 10kΩ. 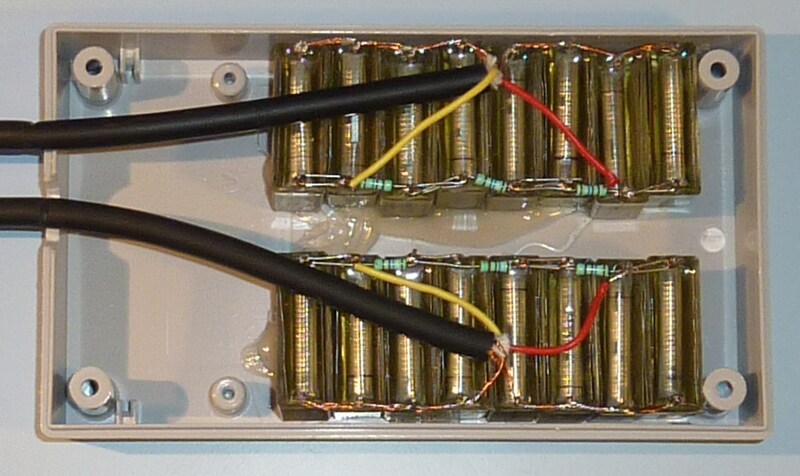 The filter is simply four cascaded 1st order RC filters made of 2kΩ resistors and 3µF capacitors. This filter response was determined by first measuring the actual amp output voltages that drove a woofer to Xmax, comparing them against the predicted values from Linkwitz’ closed-box1.xls spreadsheet, and then calculating the compressor output voltages that would take the woofer to 90% of Xmax, taking account of the gain of my amps, 27db or 22.4x. Here are some pictures showing how I measured displacement versus voltage. This table shows modeled and projected displacements for an input voltage and the voltages needed to reach Xmax. Once each filter was installed, I adjusted the compressor threshold so it would just start compressing when the input was 0.87v at 20Hz, giving the same output. For the second (and final) calibration of the 4th order filter, I adjusted the threshold for 3.1v/64Hz instead of 0.87v/20Hz to keep the voltage below the maximum at all frequencies. The following table shows the measured voltages. The filter slope deviates the most from a straight line as the filter transitions from passband to stopband at the deepest bass notes where the limiting needs to be most accurate. At lower frequencies, less power is needed to hit Xmax. I tried moving the filter knee down in frequency for more linear slope above 10Hz, but the insertion loss in the transition band was very high, approaching 50db at 20Hz for a filter frequency of 5Hz. To get straight line attenuation down to 10Hz without this much insertion loss requires an active filter with some gain set to an extremely low frequency perhaps two octaves below 10Hz at 2.5Hz. Here are two photos of the compressor and sidechain filter box (unplugged) and the internals of the filter. The caps are surplus 1.5µF film caps, two in parallel per filter section. The box cost more than all the other parts combined! I bought the dbx 166A compressor off craigslist. The seller threw in an extra one that wasn’t working. There was some odd behavior with the system and I wanted to compare the two compressors to eliminate them as the fault so I eventually fixed the bad one. An internal AC transformer fuse had blown, a resistor in one leg of each cross-coupled balanced driver had fried, and both balanced driver opamps had blown. A problem showed up on about half of the CDs I played. It mostly happened during extremely soft passages with no bass, and on the fadeout of many songs. The compressor’s gate function would kick in and out very briefly, even though the gate threshold was set to OFF. The turn on and turn off was so quick that the gate’s LEDs would flicker almost imperceptibly while the gain reduction LEDs would all light up, indicating maximum compression. The result was a slight chuffing noise during these passages due to the harmonics added to the woofer signal not being masked by the quiet music. Disconnecting the gate circuit fixed the problem. My theory is that some anomaly in the signal (DC offset, low level low frequency bursts from faders, etc) is triggering the gate circuitry in the compressor. It could be a design flaw in the compressors, or it could be that both of them are out of spec. I can listen to anything now through the Orions at any level without worrying about damaging the woofers. When the bass compression becomes noticeable on loud music, I just turn to the subwoofer. For most listening, the compressor as limiter works really well at keeping the woofers in their safe operating area while still providing more usable power at higher frequencies. I’m not inclined to find a compressor with a gate that behaves better since things are working as they are now. 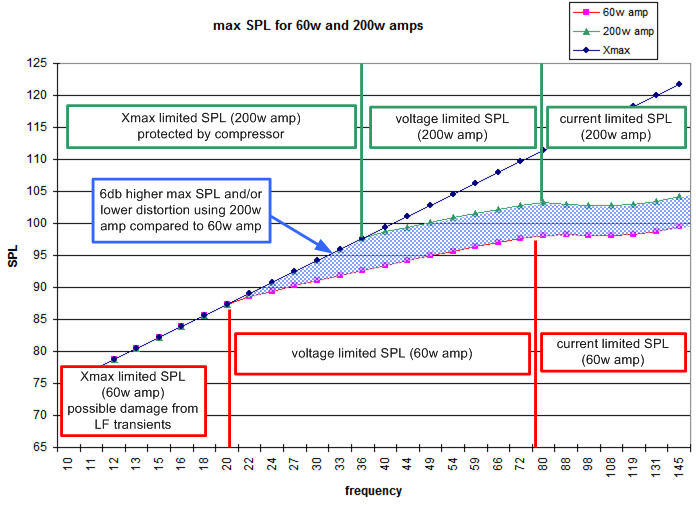 In response to Charles Port’s comment and my reply below, I’ve created the following graph showing the different SPL levels with 200w and 60w amps and the regions where the SPL is limited by Xmax, voltage, and current. This shows where the limiter protects the woofers from excess power, even protecting the woofers when very low frequency transients occur with a 60w amp. It is likely that you you would get better mileage from implementing the ORION 4.0 changes and dropping your midrange down to 92Hz, as you seem to be responding to the “overtones” in the bass …. Hi. It makes perfect sense to me. In concept it is as simple as this: any time a signal reaches the level that would take a woofer to Xmax (or beyond), you want to limit that case, ONLY. So, this is LEVEL dependent. It does not simply reduce the output of a more powerful amp (that could be done with as little as 1 resistor at the ASP woofer channel output). Furthermore, the response is FREQUENCY dependent, as is needed to limit damaging voltages ONLY. Referring to the web pages that you list, you can see that at higher frequencies, the woofers can be driven to higher voltages safely. It is only at lower frequencies that the problem arises. So, a solution is something like what Eric has done: provide limiting (compression) when the signal to the power amp is too high, at frequencies that are too low. And ideally, tailor that protection to the match the response limits of the Orion woofers. In such a case, you have the benefit of full power at all frequencies, all the time, without the potential damage to the woofers when odd program conditions occur. For me, it is rarely the “real music” that sends my woofers to the limit – it is infrasonic garbage (which the woofers cannot handle anyway). While I have only just seen this from Eric, the approach seems good to me. My own thoughts on this have been for a much simpler approach, but with “harder” limits. Congratulations, Eric. It’s important to understand that the voltage being “thrown away” is only that voltage which would drive the woofer past Xmax. Most of the time, the signal is not limited and the power is used to produce higher SPLs than the 60w amp can, or to produce the same SPL but with more headroom, potentially lower distortion, etc. 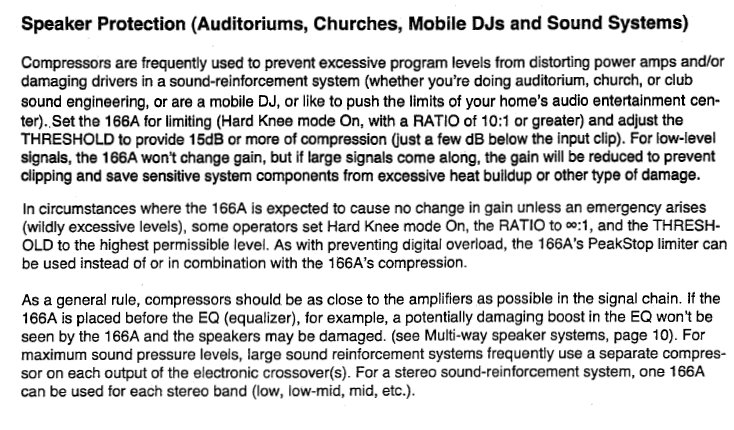 The 60w amp cannot hit Xmax above 22Hz so it’s generally safe. The 180w amp can drive to, and past, Xmax up to 36Hz, so there’s a danger there. But it can put out 6db higher SPL as long as Xmax is respected! I’ve worked extensively with SL’s graphs on the links you provided. They’re compiled from the graphs in his closed-box1.xls spreadsheet which I’ve also studied and used extensively. Now let’s compare the two graphs at http://www.linkwitzlab.com/dipole_spl_limit.htm and see where my conclusions come from. Imagine that the first graph describes my 200w amp, even though it’s a 180w amp. In the region from 36Hz and up, the 180w amp gives 5-6db more SPL than the 60w. Just compare the two graphs. Between 22Hz and 36Hz, there’s a transition from having the same Xmax-limited SPL at 22Hz, to 36Hz where the 180w amp has 6db higher SPL. They’re both Xmax limited at 22Hz, while the 60w amp is voltage limited to 6db below the 180w at 36Hz. In this interval, the 180w stays Xmax limited and has progressively more output than the 60w amp. In both regions, the 180w system has higher maximum SPL, and a bigger frequency range where it can hit Xmax (0-36Hz for 180w, 0-22Hz for 60w). So for the benefit of higher SPL (and others) I run the risk of hitting Xmax more often. This is alleviated by limiting the power when music peaks that would otherwise drive past Xmax occur. This is precisely what the 60w amp accomplishes by being self-limiting in power/voltage. As to your last point: The lower woofer/midrange transition of Orion 4.0 and 3.3 (which I have done already) is an unrelated issue. Neither amp comes anywhere near being able to drive the woofers to Xmax at 92Hz. It would take between 5k and 10k watts to do that, 183.6Vpeak according to SL’s spreadsheet. would it benefit from an amp with higher power than 60 watts. When I said an amp higher than 60 watts , I was refering to the amps driving the mids.